Bruxelles : Lacroix, Verboeckhoven & Ce, 1862. Scarce first printing of this classic work of literature, published in Brussels on the 30th or 31st March 1862. Large octavos, contemporary calf, gilt decorated compartments to the spine, red and green morocco spine labels, marbled endpapers, all edges gilt. The question of priority has been intensely debated in bibliographic circles for years. The findings of Michaux and Lacretelle definitively established primacy of this edition over the one distributed four or five days later in Paris by Pagnerre. The initial confusion stemmed from two sources: first was the prominent appearance of Pagnerre’s name–and none other–in the French edition as a “Libraire-editeur,” when in fact he was a distributing agent only; second was general acceptance of Vicaire’s claim that Hugo corrected only from the proofs for the French edition. Michaux postulated that Hugo used the Belgian editions of his works as models for the Parisian printings. To ensure publication in France, Hugo was forced to amputate certain phrases from Les Misérables that would have offended the French censor. Lacretelle later confirmed Michaux’s hypothesis. With the bookplates of Witley Court. Witley Court in Worcestershire, England is an Italianate mansion that was built for the Foleys in the seventeenth century on the site of a former manor house, it was enormously expanded in the early nineteenth century by the architect John Nash. Subsequently sold to the Earls of Dudley, a second massive reconstruction by the architect Samuel Daukes took place in the mid nineteenth century, creating one of the great pleasure palaces of Victorian and Edwardian England and contained a large library. Volume IV is the First Paris Edition. The “Septième” Edition” on the title page was spurious and meant to help boost sales. Rare and desirable with noted provenance. Victor Hugo’s “great novel has been hailed as a masterpiece of popular literature, an epic poem in prose about God, humanity, and Hugo… Hugo hoped that Les Misérables would be one of if not the ‘principal summits’ of his body of works. Despite its length, complexity, and occasionally unbelievable plot and characterization, it remains a masterpiece of popular literature. It anticipates Balzac in its realism, but in its flights of imagination and lyricism, its theme of redemption, and its melding of myth and history, it is uniquely Hugo” (Dolbow, 149, 214). 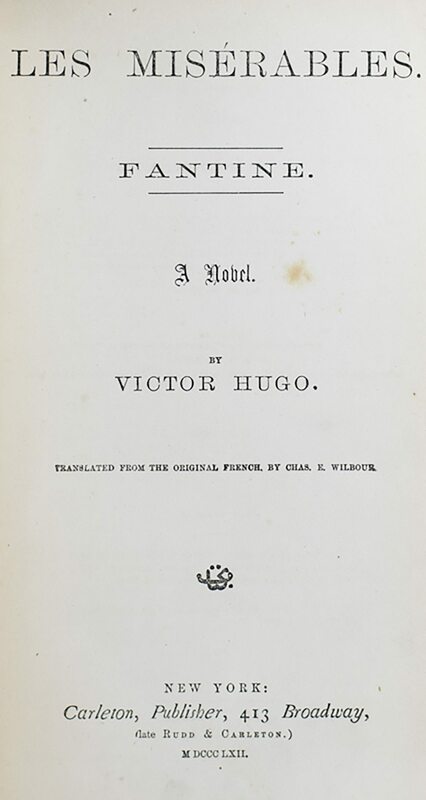 Charles E. Wilbour was hired by the Carleton Publishing Company to translate Hugo's grand masterpiece, and he did so very quickly, allowing the first American edition to be published within months of its French release. The intense advertising campaign waged by Carleton resulted in massive sales for Les Misérables, solidifying Hugo's epic in second place (behind only Uncle Tom's Cabin) in pre-Civil War American book sales. 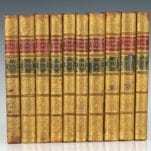 The Novels of Victor Hugo: Complete and Unabridged. Limited edition, number 50 of 1,000 sets on Holland paper. 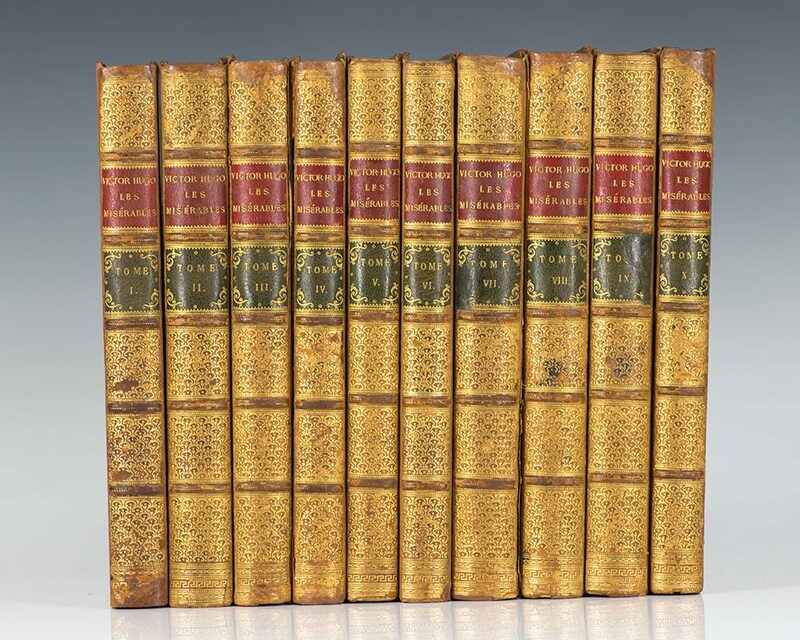 12 mo, 28 volumes. Bound in three quarters morocco by Sangorski and Sutcliffe, gilt titles and tooling to the spine, gilt lined to the front and rear panel, inner dentelles. Top edge gilt, marbled endpapers. Each volume is illustrated with engraved plates, tissue guards present. In near fine condition with a touch of rubbing. New York : Carleton, Publisher, 1862. First American edition and first edition in English of Victor Hugo’s masterpiece. 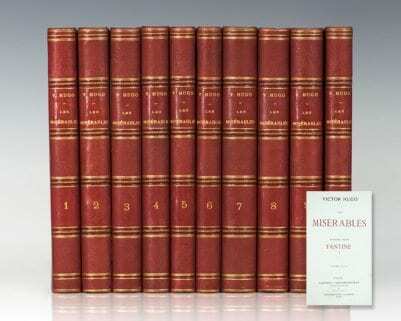 Complete in five large octavo volumes. Fantine (171 pages plus four-page publisher’s advertisement), Cosette (164 pages plus four-page publisher’s advertisement), Marius (150 pages plus two-page publisher’s advertisement), Saint Denis (184 pages), and Jean Valjean (165 pages plus two-page publisher’s advertisement). Publisher’s matching cloth with gilt spine titles. In near condition with light rubbing. 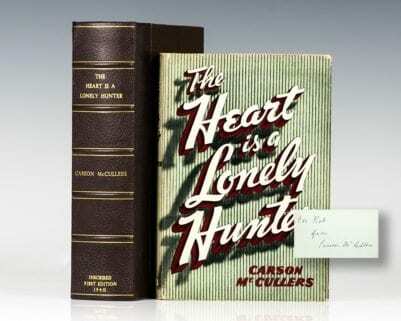 Housed in a custom cloth clamshell box. Uncommon in this condition. 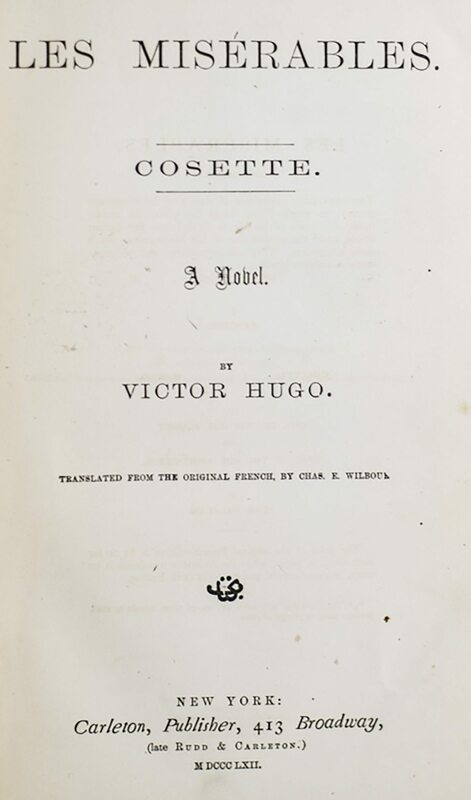 Parisian first edition of this classic work of literature, published on April 3rd, 1862 (three days after of first printing in Brussels on March 31st of 1862). Large octavos, half crushed red morocco over marbled boards, gilt titles and tooling to the spine, marbled endpapers. False mention of “Septième Edition” on the title pages of volumes I-III, and “Huitième Edition” on the title page of volume IV, which were spurious and meant to help boost sales. In near fine condition. A nice presentation.